The following information and photos (unless stated otherwise) are copyrighted and have been reproduced with the permission of the owner of the material: Dr. 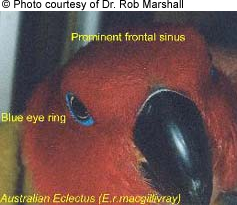 Rob Marshall - an avian vet and bird breeder in Australia, and author of "A Guide to Eclectus Parrots as Pet and Aviary Birds". the Solomon Island Eclectus (Eclectus roratus solomonensis). Identification of the subspecies is challenging in the female and almost impossible in the male without knowledge of the area of origin or domestic breeding history. Hen classification of some of the subspecies remains difficult without knowledge of their geographic origins. Females of the Blue (polychlorus) group have a blue eye ring, blue breast colour and lack yellow in their plumage. 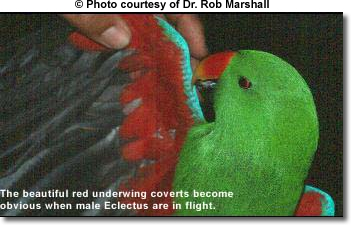 Some consider Aru Island Eclectus (E.r.aruensis) and Biak Island Eclectus (E.r. 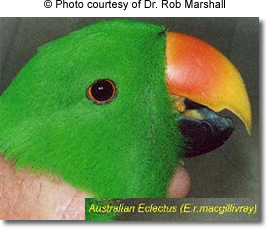 biaki) to be variations of the New Guinea Eclectus (E.r. polychlorus). These subspecies have no blue eye ring. The different colour purple of the chest feathers readily distinguishes one from the other. E.r. roratus has a purple colored breast and dark maroon colored wings. E.r. vosmaeri is brighter colored than E.r. roratus. The breast is pretty lavender (pale purple) and wings are a fire engine red colour. Both these subspecies are entirely red. E.r. cornelia is larger but has no yellow on the tail contrary to E. r. riedeli. Identification of the males from most subspecies remains difficult and relies upon differences in size and shade of green of the plumage. Both size and depth of green however may vary considerably within the same subspecies. 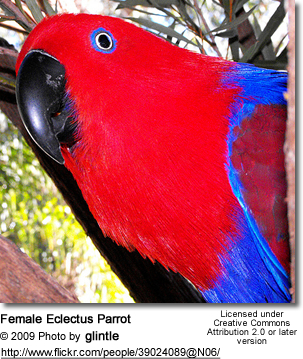 Male Eclectus are difficult to distinguish into species with the exception of macgillivrayi, riedeli and westermani. Macgillivrayi is large and long with a distinctive broad square head. Riedeli and Westermani are smaller and have distinct features. Variation between individuals of the same sub-species also creates complication in identification. Further classification difficulties arise because interbreeding of subspecies has been common in the past. 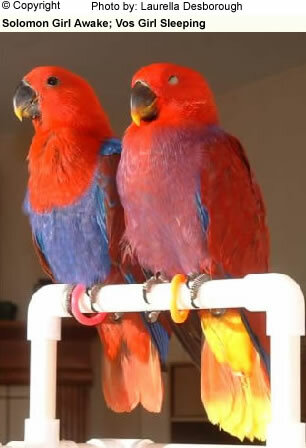 As a result, confusion often arises when attempting to identify the exact sub-species of captive bred Eclectus Parrots.